To celebrate the milestone of the first anniversary of Toledo Wines and Vines, we offered up a contest with goodies being provided by True Fabrications, a cool Seattle wine accessory store. We're pleased to announce that Liana Carr is the grand prize winner, taking home the Vinturi wine aerator. Here is Liana's entry. My favorite wine is Steltzner Vineyards Claret. I was first introduced to this wine at Biaggi's Restaurant. I was stumbling with a red wine selection and the waiter said, wait one moment. Much to my surprise, he brought me 4 tastings. I tasted the first two and so so, I tasted the third and said hmmmm. I then tasted the fourth and went back to the third as my final selection. About a couple of months later, I went to a wine tasting downtown. I was with my mom and my sister and we were having a great time. I had a couple of white tastings and then I moved onto red. My mom handed me the red so I didn't know the of the name of it. I said hmmmmmmm what a great wine. I went over to see the name of it and I was pleased in seeing the words Steltzner Claret. I still to this day choose this wine as my favorite. Liana, thanks for sharing your wine experience. 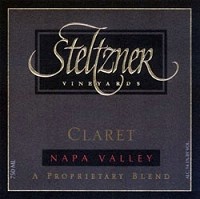 The Steltzner Claret is a blend of Cabernet Sauvignon, Merlot and Cabernet Franc. The grapes come from Steltzner's Stags Leap vineyards as well as other Napa vineyards. Stags Leap is well known for ultra quality wine.